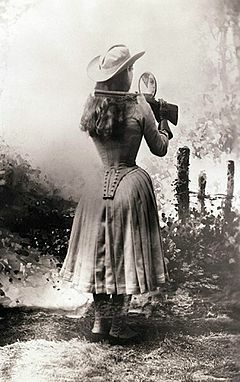 On April 24, 1885, Phoebe Ann Moses, better known as Annie Oakley, joined Buffalo Bill’s Wild West Show and was a star attraction for the next 16 years. Annie was born in North Star, Ohio in 1860, a somehow appropriate location considering her future stardom. Born into poverty in a log cabin, Annie took to trapping and shooting by the age of 8 years. Even at an early age her marksmanship skills became well known and her ability to kill game animals considerably assisted the family finances. When a traveling shooting show came to town the professional marksman put up a $100 bet that he could out shoot any of the local shooters. Annie, at 15 years old and at her maximum height of 5 feet even represented the locals and out shot the professional. Oddly enough, Annie became that marksman’s wife, the two working together as exhibition shooters. By 1885 Annie’s fame was such that she joined Bill Cody’s western extravaganza and quickly became a crowd favorite. Shooting a playing card in half (edgewise) at 30 yards was a considerable feat, but Annie not only did that but also shot the card a few times before the halves hit the ground. The great Native-American chief, Sitting Bull, was also part of the show and this wise old man considered Annie like a daughter, whom he called “Little Sure Shot.” When the US appeared ready to go to war with Spain, Annie offered to raise a force of 50 female sharpshooters, but was turned down by the government. Injured severely in a train accident, several spinal surgeries ended Annie’s career with the Wild West Show, and she started acting in a play written just for her. While performing her feats of marksmanship, Annie performed for the Queen of England, King of Italy, President of France, and Kaiser Wilhelm II of Germany, as well as other heads of state, royalty, and celebrities. 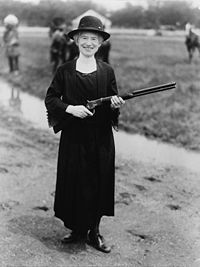 It is estimated that Annie taught about 15,000 women and girls how to shoot firearms. In a cracked turn of events, William Randolph Hearst incorrectly reported that Annie had been arrested while stealing to finance a cocaine addiction in 1904. Apparently, a stripper used “Annie Oakley” as an alias and gave that false name when arrested. Annie sued and won 54 of 55 libel suits related to this incident. It seems newspapers were no more fact conscious then than now! Retaining her shooting skills as she aged, even getting better with time, Annie also starred in a silent movie in 1922, but was injured along with her husband in a car wreck shortly afterwards. Her health declined steadily after that and she died in her native Ohio in 1926. Annie had been quietly generous throughout her life, especially toward young girls and women, with her entire considerable earnings having gone to charities and her family. This wonderful lady is remembered by the slang term “Annie Oakley” meaning a free pass or ticket, which is usually punched with one or more holes similar to the playing cards she used to shoot. Annie has been portrayed in numerous films, plays and books, and has been played by actresses such as Barbara Stanwyck, Ethel Merman, Geraldine Chaplin (Charlie’s daughter), Mary Martin, Reba McEntire, Betty Hutton, Marilu Henner, Bernadette Peters, and Cheryl Ladd. If you are too young to know these names, be advised that they make an impressive list of famous actresses indeed. Rock bands Squeeze and The Geraghty’s both recorded songs about Annie. Gone but obviously not forgotten, Annie lives on in print and film, the first female superstar of American entertainment. What other women of the wild west comes to your mind when you think of those days? Spinner, Stephanie and Who HQ. Who Was Annie Oakley? Penguin Workshop, 2002. Wills, Chuck. 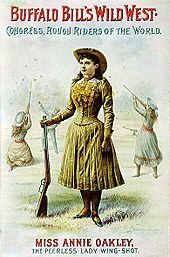 DK Biography: Annie Oakley. DK Children, 2007.